Please enter 1 Hebrew name for each glass if personalization is desired. We will also put the date of celebration on the bottom, complimentary. Crystal Hand Made Champagne Wedding Flute Glasses by Steve Resnick Studios, etched with Ani L'Dodi v'Dodi Li. Size is 7 inches H. Comes with 2 Flutes, the first one etched in Hebrew, Ani L'Dodi, and the second etched in Hebrew, V'Dodi Li. I am my beloved's and my beloved is mine, from the Song of Songs. Have your Hebrew names etched on the glass and date etched on the bottom. $40 for personalization. Limited amount available! Ani L' Dodi Wedding Flute Glasses come etched with a Rosette of Leaves design. 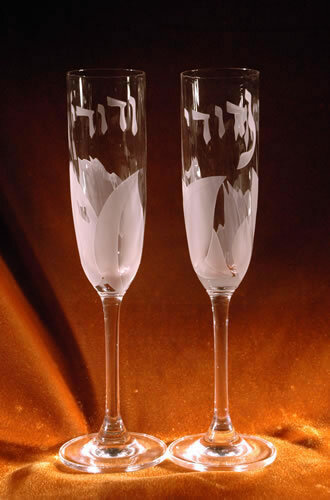 As an option, have your Hebrew name etched on the flute glass in Hebrew text. Additional charge of $40. Etching of date on the bottom is complimentary with name engraving. The Ani L'Dodi Wedding glasses were a gift for our wedding. We loved them. Had our names etched in Hebrew. Date was etched on the bottom. We recommend this gift for all wedding couples regardless of their religion. We searched forever for these Ani L'Dodi Flute Glasses by Steve Resnick. Jewish Bride inscribed our Hebrew names and date on the crystal. They were a hit at our Wedding. Thanks Jewish Bride for helping us find the perfect toasting glasses. We really love them. We are recommending your company to our friends.